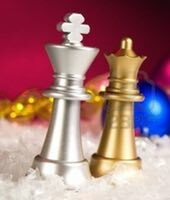 Cowley Chess Club invites you to its 2017 Christmas Blitz Tournament, which will be held on Monday 11 December at Cowley Chess Club (at Rose Hill Methodist Church in the Main Hall downstairs), with Round 1 beginning at 7.15 pm. All chessplayers are welcome. There will be ten games in the Blitz (five rounds playing games with both colours, with five minutes per player per game). A cash prize of 10% of the entry fees will be an option for the tournament winner, with lots of other prizes of books, etc., including grading prizes, prizes for juniors in various age groups, for the best slow starter, etc. (see the club website [https://sites.google.com/site/cowleychessclub/cowley-blitz] for lists of prizes and prizewinners in recent blitzes). We rely on donations of prizes, not only chess books but also other (non-alcoholic) prizes, and these will be gratefully received. Round 1 is scheduled to start at 7:15pm. Players who have not notified their entries in advance are asked to register by 7pm at the venue on the night, to enable pairing cards to be written and the draw for the first round to be completed promptly. Advance registration by email will be accepted until 3pm on Monday 11 December.